The first class is used to introduce the Co-Trainers and welcome the class attendees. An overview of the 12 week course is also provided. The first day focuses on the course curriculum, our emotional reactions to mental illness, getting to know each other, our personal belief systems, our personal goals and general understanding of illness symptoms as outlined. In the second class, the format will change slightly to begin with a lecture on the symptoms and diagnosis of schizophrenia, major depression, bipolar and schizoaffective disorder. The talk will particularly focus the manic phase of bipolar disorder, psychosis, the process of diagnosis, stigma, myths versus the real risks of mental disorders, and dealing with critical periods in mental illness. The format follows seven immediate questions surrounding these critical periods. In the third class, the group will review mood disorders and anxiety disorders. The symptoms and diagnosis of the various forms of depression are discussed, as well as those of anxiety disorder and obsessive-compulsive disorder. The class also learns about the evolution of recognition for these diseases, including the challenges to diagnosis, the relapsing nature of the disorders, and how treatment relates to diagnosis. The class will also learn about overlaps between diagnosis and borderline personality disorder, as well as the significant issue of dual diagnosis and the complications of addiction. The group will also discuss their personal experiences. The fourth class mixes lectures and discussion about the basics of brain research and how the brain functions with mental illness. The surge in new information from research on the complex biology of the brain has presented discovery after discovery on the physical basis of mental disorders and theories on the edge of new research. The class will also learn and discuss the genetic side of brain disorders, the time of greatest conflict in the stages of consumer recovery and stages of family emotional response, and an overview of the recuperation process. The fifth class focuses takes the problem statement, completed in Class 4, through the Problem Solving Skills Workshop. 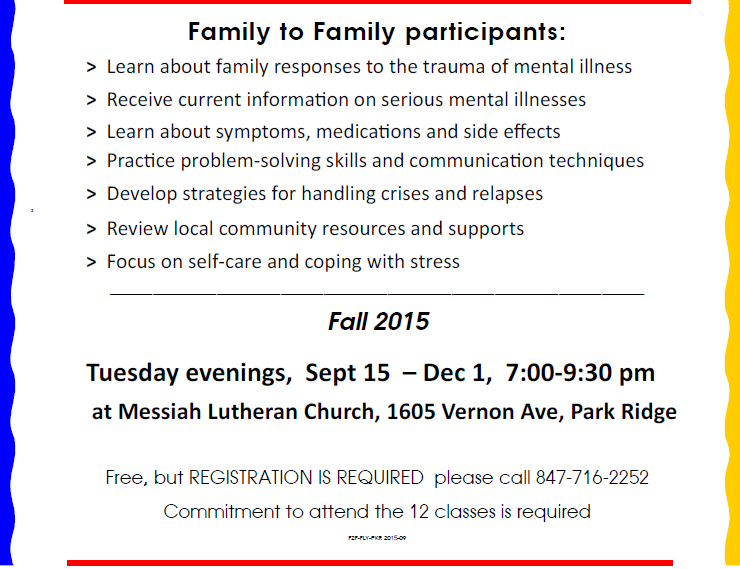 This Workshop will present structure for the problem pile-up that often occurs in families living with mental illness. Participants will simplify and define the single most important problem, evaluate and use different solution strategies, and set appropriate limits. The sixth class will return to a feast of information, this time about medications. After establishing the ground rules, the group will learn about and discuss the medication process from molecular level to side effects and helping our loved ones stay on target with regimen adherence. The participants will also learn how to recognize early warning signs of relapse and gain a sense of what our family member is experiencing as they begin treatment. In the seventh class, the group will learn more about the perspective, trauma and demoralization experienced by the person living with mental illness. The group will explore two case histories, stories of people with brain disorders and how they adjust and react to this vast alteration of their life circumstances and expectations. Participants will explore how illness relates to self-regard and learn guidelines to help families help their relatives maintain self-esteem and confidence. 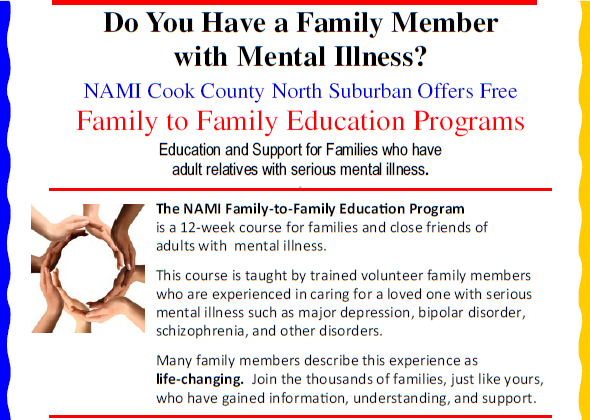 In the eighth class will focus on improved communication skills with a family member whose illness can inhibit the processing of information as well as family members who are uncertain of how to proceed with emotional expression. The group will learn more about how their family member may be organizing complex ideas and how to exchange emotional information in a more constructive way, as well as practice these methods in a group exercise. This will help family members connect to the person “behind the symptoms”. The ninth class serves to introduce ways to care for the self while taking on the responsibility for care of a relative with a mental disorder, particularly when there is so little social and public support for this kind of family crisis. Participants will discuss both the practical and emotional burdens of coping with these types of diseases, overcoming guilt and shame about our feelings regarding our new role in the family. Frankness and honesty are encouraged as the participants meet in small subgroups to share their feelings. The entire group will then discuss ways to achieve a balance between caring for our ill relative while living our own lives as fully as possible. The tenth class introduces the new realities of recovery and rehabilitation in mental illness, a change in future possibilities in the lives of our ill loved ones that did not seem possible until ten years ago. The class will also discuss the current system of support, both socially and in terms of community resources, and how to find assistance and advocate for the creation of the best rehabilitation programs. There will also be a one hour special presentation by a visiting speaker. The eleventh class brings facts about stigma, public misinformation, and social services failures surrounding mental illness. The group will learn more about NAMI’s Campaign for the Mind of America and other campaigns to fight discrimination and demand better services for people with brain disorders. A class discussion will focus on the real need for advocacy and what each individual can do to improve public treatment of mental illness in each community. The twelfth and final class presents certification of completion of the Family to Family Course. The participants will evaluate their experience and also learn more about local support groups. Last but not least, a celebration of new knowledge and support, as well as a last moment of sharing before the close of the course.